The army of the Earl of Surrey is said to have mustered near Bolton during the 3rd – 5th of September 1513 and on a number of occasions he used the chapel to worship in. About 1855 a grave was being dug on the north side of Bolton churchyard when ‘the grave-digger came upon what he thought to be the end of a large drain’. This ‘drain’ was in fact an ancient British burial cist containing an urn. Few, if any, burials had taken place on the north side due to the superstitious belief that this was ‘the devils side’, and was therefore only used for the burial of strangers, criminals and suicides. However, several hundred years of burials on the south meant that ‘it had become a mass of bone dust’, thus forcing the use of the north. The urn found was so badly broken that it could not be pieced together but, about the same time, another urn was found in the grounds of nearby Bolton Hall. This is now in Alnwick Castle Museum. Finding this cist and urn at this spot, together with the fact that the present church stands on a mound within a circular enclosure, suggests a sacred pre-Christian site. Although there is no evidence of Roman occupation at Bolton, artefacts of the period have been found, including the base of a small bronze dish which was excavated in the Guards field lying to the north of the chapel. During the Saxon period a ‘tun’ or homestead was formed near a ‘bol’ meaning a high swell of land, which was possibly the mound on which the church now stands. This settlement became the village of ‘boltun’, now Bolton. 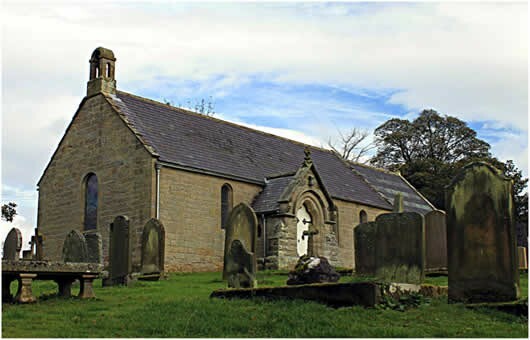 A wooden church could well have existed at this site when the parish of Edlingham which includes Bolton Chapel, was established some time in the 10th century. After the Norman Conquest Bolton became a manor within the barony of Wark-on-Tweed, held by Walter Espec. In 1122 he founded the priory of Kirkham in Yorkshire, endowing it with two parts of the tithes of Bolton. The earliest references to a chapel at Bolton appear in two charters, held at Durham Treasury, which are dated about 1175. These charters are confirmations of the transfer of Edlingham church, with Bolton chapel, from St Albans to the Prior and Convent of Durham. The Melrose Chronicles state that in 1209 King John met William the Lion, King of Scots, at Bolton. King John at this point had been excommunicated and England lay under a Papal interdict, which meant that churches were closed and worship forbidden. Walter Espec died without issue and the barony of Wark-on-Tweed passed to the offspring of his sister Adeline, wife of Piers de Ros. Their great- grandson, Robert de Ros, and his wife Isabella, a natural daughter of William the Lion, founded at Bolton, about 1225, a hospital for a master, three chaplains and thirteen lepers. This hospital was dedicated to St Thomas the Martyr, and stood in the Guards field, then an island surrounded by bog. The vill of Bolton was given to the brethren for the maintenance of the hospital, who were instructed ‘to keep a good table, dress neatly, and provide for the poor and strangers’. From the 13th century through to the 16th century the history of Bolton is that of the hospital, the founding of which gave rise to many disputes and agreements. Between 1225 and 1233 the brethren were granted a licence to build a chapel at the hospital for their own use. All their tithes, except those of gardens and hens, were to be paid to the church at Edlingham. The brethren and ‘others regularly wearing their dress,’ were to be buried in the hospital chapel while all others had to receive the divine offices and be buried at either Edlingham church or Bolton chapel. About this time revenues from Bolton were used to endow and maintain an altar in the south transept of Durham Cathedral which was dedicated to Our Lady of Bolton. An early stained glass window in this chapel depicted Our Lady of Bolton ‘with a gold mase (mace?) in her hand, a crown of gold on her head, a monk under her feet, kneeling and praying with elevated hands’. Above the altar stood a wooden statue, ‘a wonderful and beautiful image called Our Lady of Bolton’. Only two altar pillars remained after the destruction of the chapel at The Reformation. This area of the Cathedral is now the Durham Light Infantry Memorial Chapel and the present altar stands on the site of the original. The Bolton brethren were amongst the earliest Border reivers (thieves) because in March 1285 the master of the hospital, and several of the brethren, were accused of stealing goods and burning houses at Branxton. This area suffered greatly during the next 300 years as armies marched, fought and fled across this frontier. The land was wasted and burned many times, and the people harried and slaughtered. The army of Edward I was amassed at Bolton in 1295 when Hugh de Cressingham, Treasurer of England, wrote to London requesting £2,000 urgently. Two years later his body was flayed by the Scots and his skin used to make sword belts. William de Felton, Lord of Edlingham, was instructed in April 1312 to hear an enquiry concerning those who, at Bolton, had killed the King’s serjeant-at-arms. In 1313 sheep were bought from the hospital ‘for the use of the royal household’. Once again the English were heading north to fight the Scots who, under the leadership of King Robert the Bruce, defeated them at the ensuing Battle of Bannockburn in 1314. The goods of Bolton chapel, including the missal (service book), chalice, and vestments, were stolen in 1343 by the master of the hospital, his chaplin and seneschal, who were annoyed that the Vicar of Edlingham had been granted most of the tithes of Bolton! During this period the border area was divided into 6 Marches, Bolton being in the English Middle March. In 1363 an enquiry was held to investigate the death of John de Coupland, warden of the Scottish Middle March, who had been found murdered on Bolton Moor. In charge of the Scottish East March in 1475 was Lord Alexander Hume who escorted the master of Bolton hospital, acting as envoy to Edward IV, ‘from the Tweed to the presence of King James III’. Before the Battle of Flodden in 1513 the army of Henry VIII encamped here under the command of Thomas Howard, Earl of Surrey. In Bolton chapel he and other nobles, ‘partook of Holy Communion and pledged themselves to defeat the Scots or die on the field’. Two days later King James IV lay dead on Flodden Field, along with some 9,000 of his followers. After this bands of trained local men were used to guard the frontier and the Muster Rolls of the period (1538) lists 25 Bolton men. By 1547 St Thomas the Martyr hospital at Bolton had been dissolved, and in 1553 Edward VI granted the lordship and manor of Bolton to Robert Collingwood of Eslington, however, the site of the hospital remained in Crown hands until 1575. The Collingwoods held the lordship and manor for three generations until, in 1658, it passed to the Widdringtons. Thereafter it changed hands several times passing to the Browns, the Fosters and, finally, the Burrells of Broome Park. A communion cup and paten made in Newcastle in 1730, and presented to the chapel by the Rev Dr Eden, a prebender of Durham Cathedral, is still in use. The only remaining internal feature of the early church is the Norman chancel arch. This is of simple design, stepped towards the nave, without decoration, and supported on very worn imposts carried as bands along the east wall. Externally the chancel south wall is constructed of roughly squared rubble which changes in the lower courses to much larger masonry set upon a plinth. This could also be the remains of the early church. Set into this wall is a blocked up square window opening. Most of the chapel is a very plain Neo-Norman style, the nave having been completely restored in 1860. The chancel was restored in 1868 by the Rev. Matthew Burrell, vicar of Chatton for 25 years, and son of William Burrell of Broome-Park. It has a rather ornate ceiling, and a stained glass window of three lights, given by Bryan and Frances Burrell in memory of their children, one of who drowned in the Bay of Melbourne when a squall capsized his boat. Above this is a circular Agnes Dei. The window on the south, depicting a knight in armour, is in memory of Bryan Burrell, a major in the 15th King’s Hussars. Set into the west wall of the nave is a crucifixion window, a memorial to the already mentioned Bryan and Frances Burrell or Broome-Park. Below this window is a very ornate font which was given by William Gray of East Bolton House. The classically designed ‘bowl’ dated 1732, now displayed in the north transept, lay outside for many years before being placed here. It may be the earlier font. Among the wall plaques is a typical Victorian epitaph to Eleanor Gray, wife of William Gray. She was the daughter of General Walter Ker of Littledean in Roxburgh who built East Bolton House, now dismantled. General Ker, unfortunately, became involved in a law suit as a claimant to the Dukedom of Roxburgh. He lost his case, which left him a ruined man, and was forced to sell East Bolton House to his Gray son-in-law. Some fine monuments are mounted on the walls and those pre-dating the 1860 restoration must have been in the old church. The oldest of these is a painted sandstone panel set into the north wall of the nave. It displays the arms of Brown of Bolton. The inscription on the Castles memorial is repeated on a slab set into the floor. Many generations of Castles were buried here, including Thomas ‘one of the greatest dealers of sheep in the country’. In 1773 he was crossing a burn near his house, fell from his horse, and drowned. On the south wall is a memorial carved by Blore of Newcastle which displays the arms of Brown and Foster. This plaque records all the names of the local landowners who intermarried. To the left of this is a plaque to Lewis de Crespigny Buckle who perished at sea while sailing on the S S Nemesis. His father was a vicar of the parish for 52 years. In the chancel are numerous plaques in memory of the Burrell family. The oldest of these bears the name Martha Burrell and is dated 1700. It shows the arms of Burrell impaling those of Reveley. In the graveyard are several 18th century headstones. One standing south of the chancel is Grade II listed and displays a cherub within a tympanum with fluted pillasters at each side. This is known as the Hall stone and dates from 1732. East of this stands a cross carved with twining ivy, in memory of Catarina Petretini Marshall, a descendant of Mocenigo, doge of Venice. Her daughter Louise married Arthur Gray of East Bolton House. Outside the east window lies Mary Trotter (d 1834) and two of her daughters. She was the wife of the Rev. Robert Trotter, one of the early Presbyterian ministers at Morpeth. They had four sons, three of whom became doctors, and three daughters, the youngest of whom, Mary Anne, married William Pawson of nearby Shawdon Hall. A small obelisk at the north west marks the burial place of the Rev. Duncan Lennie, a Presbyterian minister at Glanton for 13 years who, according to his wishes, was buried here at his death in 1858. This ancient burial ground is no longer used, but on the site of the original church the present small congregation continues the worship and prayer of centuries. The mother church is St John the Baptist, Edlingham, which we hope you will also visit. There are no facilities at Bolton. There is parking on the grass verge beside the gateway to the Churchyard. 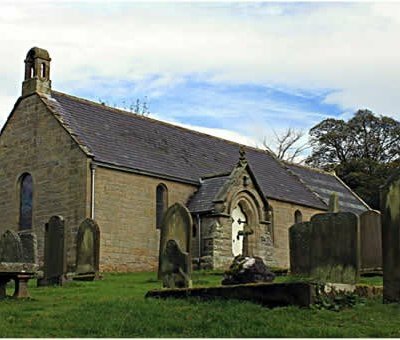 The church is to be found approximately 2 miles east from the A697, south of Wooler. There is a crossroads on the A697 approx. 2 miles south of Powburn. Turn east on the road signposted Bolton and the Chapel is approx.. 2 miles along this road on the left hand side.